The power of the force and pressure of water has been something that has frightened me ever since I was a little girl. This fear is not based in my swimming ability (or lack thereof.) I started swimming when I was a little girl and actually find swimming laps very therapeutic, albeit, I do not go swimming often. Likewise, my fear does not stop me from swimming in pools, ponds, lakes, oceans, etc. In fact, I consider my distrust of water a very healthy fear – one that is based in the fear of the power of nature. I was born in the great state of Alaska, on account of the adventurous natures of my parents. They truly made the most out of their 4-year Alaskan experience: living in a log cabin, owning a purebred husky, frequent camping, getting chased by a moose, encountering a grizzly out in the wild, taking care of their landowner’s herd of sheep during summer vacation (and yes, they got out – apparently, it is hard to round sheep up if they get out of a pen), surviving 24 hour-light summers and 24 hour-dark winters, attending a birthing party at “the shack” (and yes, a baby human was born in the midst of the festivities), losing control of the car and plunging off the side of a cliff (according to my parents and another friend/witness in the car, “not quite a Thelma-and-Louise, but close”), etc. Although I loved these adventure stories, my parents were always careful to warn me of the risks associated with adventure. After their years in Alaska, my parents came to the opinion that nature is a hypnotizingly beautiful, yet destructive, force. Every year, my parents had friends and acquaintances that were killed in accidents – plane going down in the wilderness, car driving off the side of a remote icy road, boat being capsized by a glacier river, etc. The families of these victims were lucky if a body could even be recovered – most simply disappeared for good or, at least, until the snow thawed. Nonetheless, I have never been one much for “nature tourism” – taking a trip solely for the purpose of hiking, biking, scuba-diving, skiing, etc. I mention this one fact to introduce the book I read on the Maldives. Now, many of my readers may not know of the Maldives. This country (which is a member of the United Nations) is the smallest country in Asia – both land-wise, and population-wise. This country, which is located in the middle of the Indian sea, consists of “more than 1,000 islands together with innumerable banks and reefs, [and] are grouped in a chain of 19 atolls.” (page 10) As my geography skills are lacking a bit, I did not know what an “atoll” was before I read this book. 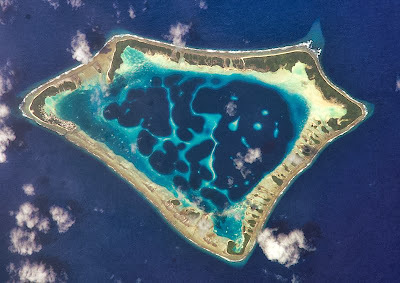 The theory of atoll formation was actually by Charles Darwin: “Darwin’s revolutionary view was that an atoll is not the coral encrusted rim of a volcanic crater, as had been thought, but is formed when a small volcanic island, or tip of a mountain peak, gradually subsides into the sea.” (page 30.) I am including a photograph I found on Wikipedia of an atoll or often-called “lagoon island”, to give my readers a better understanding. Needless to say, these lagoon islands and their coral attract a great deal of tourism to the Maldives. Tourism, in fact, accounts for more than 25% of the GDP, which is not a stabilizing factor to the economy of the Maldives. Following the destruction from the 2004 tsunami, the GDP of the country contracted 3.6% in 2005. A consequence of the popularity of the tourism industry in the Maldives was that it was nearly impossible for me to find an academic book about the country, which has a population of less than 340,000 people.) Instead, I had to purchase a tour book, Maldives: Kingdom of a Thousand Isles by Andrew Forbes, published by Odyssey Guides. Although I did not like doing this (at all), I was comforted by the fact the author was quite educated, and actually held a Ph.D.in Central Asian History. As a scholar, he has interspersed the typical information in a guide book with excerpts from published academic articles which he had written about the Maldives. These articles provide a much stronger insight into this country’s society and history and include such topics as: Africa and the Maldives in an article originally published in the Journal of the Kenya Museum Society; Archaeology and Artifacts in the Maldives in an article published in the Far Eastern Economic Review; and Black Magic in the Maldives Worldview in The Asian Wall Street Journal. Although the book does not delve into the history of the island, it is clear that the island nation had a different course of history than many of the other countries in South Asia, particularly when it comes to colonialism. “European influence has been slight. 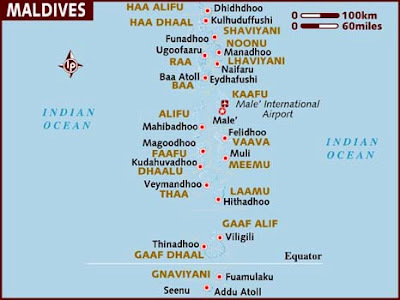 The Portuguese occupied Malé [the capital, as well as the most populous island of the Maldives’ in 1558. Intolerance and cruelty marked their rule, and the Maldivians responded with guerilla warfare… After the Portuguese debacle the isolated Sultanate was left alone by the European powers until 1877, when the Maldives became a British Protectorate. Under the terms of this agreement Britain assumed responsibility for external affairs, but the country remained internally self-governing.” (page 14) Described by the author as an “imperial afterthought,” the Maldives gained its independence in 1965. The author notes that “Today it is necessary to be a Sunni, Shafi’i Muslim to be a Maldivian citizen.” (page 72) I found this citizenship definition particularly interesting after I learned of the recent government human right violations in the past few years and the subsequent global controversy. Historically, the Maldives had ties to many areas of the world and in fact “Maldivian cowries continued to be used as currency in parts of eastern Africa until as recently as 1921.” (page 62) After so many years of economics courses (with the topic of currency frequently discussed), I thought that this fact was extremely interesting – and imagined how scarce a resource these Maldivian shells must have seemed to the Africans who used them as currency.